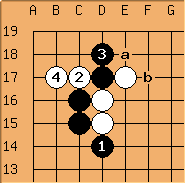 Sensei's Library is a popular collaborative web site about the game of Go. To facilitate discussions of Go board positions, the website defines an easy-to-use markup language and uses a back-end program to generate Go diagrams from text input. This open-source program has been integrated into Go4Go's content management system so all user posts here can also benefit from such nice feature. Each line starts with $$. Go board boundaries are described using -- (two minus signs for each column) and | (for each row). Black stones, white stones, empty points and hoshi (star) points are represented using letter X, letter O, dots (. ), and commas (,), respectively. Up to 10 moves may be placed on the board using numbers (0 is interpreted as move 10). Lower-case letters a...z can be used to annotate game positions. Set $$W so that white side plays first. Default is $$B but letter B can be omitted. Use $$c to turn on coordinate on the board. If combined with the above option, use something like $$Wc. Use the m option to set the starting move number, e.g. if $$Wm7 is used, then move corresponding to number 1 in the text is displayed as . After all the keywords, a text description can be provided which will be reproduced as a caption to the generated diagram. Finally, the generated diagrams are clickable. Once clicked, corresponding SGF files can be donwloaded for offline viewing in Go software. The short tutorial here should cover most practical situations. For the full description of the input format, see How Diagrams Work. Generate diagrams of pro-game positions directly from Go4Go's SGF viewer pages. Empty board templates are available. Simply copy/paste. Using software to generate Go diagram input: Drago; Kombilo; Quarry. Submitted by Bloemen on Sun, 2017-11-05 19:26. I year or so ago I bookmarked this page, very handy: I used it quite often. Apparently something changed recently, now the diagrams don't show. Please, could you correct this? Thank you! Submitted by macelee on Sun, 2017-11-05 21:28. Fixed. Occasionally these get messed up by a system upgrade.